Peoria Journal Star, IL; Topeka Capital Journal, KS; Northwest Arkansas Times, AK, Daily Globe, MN, Progressive Populist, IA. Common Dreams. Distributed by Minuteman Media. While most Americans associate September 11th with violence, in one of history’s great coincidences, that date also marks the centennial of one of the most significant steps in humanity’s long quest for peace. On September 11, 1906, 3,000 people, mostly Indians, packed the old Empire Theater in Johannesburg, South Africa. They came to protest a draft of the Asiatic Law Amendment Ordinance that would require that every Indian over the age of 8 be fingerprinted and carry a registration card. Moreover, the law stipulated that the police could enter the home of any Indian at their discretion and fine, imprison or even deport those found without proper identification. A young lawyer, Mohandas K. Gandhi, took the stage to explain a resolution that he had helped draft that pledged that no Indian would cooperate with the proposed law if it passed. In the heat of the moment, one of the speakers following Gandhi vowed “in the name of God” that he would never comply with the degrading law and urged everyone present to do the same. Being a deeply religious man, Gandhi was startled. Not knowing what he was going to say, but feeling compelled to explain the gravity of invoking God in such an oath, he rose again to address the audience. Awestruck by the eloquence and power of Gandhi’s words, all present in the theater that fateful afternoon stood together with their hands raised and took an oath of nonviolent resistance. This dramatic scene, captured so vividly by Richard Attenborough’s Oscar-winning film “Gandhi,” was the birth of Satyagraha. 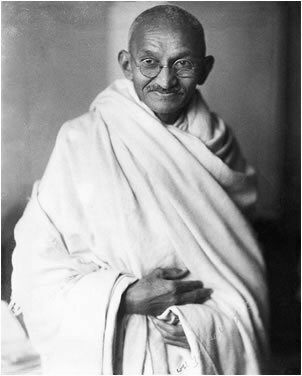 Gandhi coined this new word to replace the misleading phrase “passive resistance,” and defined it as “the force which is born of truth and love or nonviolence.” Using Satyagraha, Gandhi not only led India – the jewel of the British Empire – to independence in 1947, but inspired numerous other nonviolent movements around the world. Despite the remarkable triumphs of nonviolence during a century so drenched in blood, we continue desperately to cling to the myth that violence can solve our problems. With this hope, we pour roughly as much money every year into the Pentagon, according to the authoritative figures of the Stockholm International Peace Research Institute, as the rest of world combined spends on defense. The sad results, however, of this misplaced faith are evident. The effects of our war in Iraq are no different. As a recently released poll by the Pew Research Center revealed, much of the world that once had sympathy for us now considers the United States the greatest threat to world peace. Violence is bankrupt, and as the adage goes, inevitably breeds more violence. This may be the greatest lesson that we can learn from what happened on September 11th five years ago and our disastrous reaction to it. Thankfully, on that same date 100 years ago Gandhi showed us the only path out of this madness.